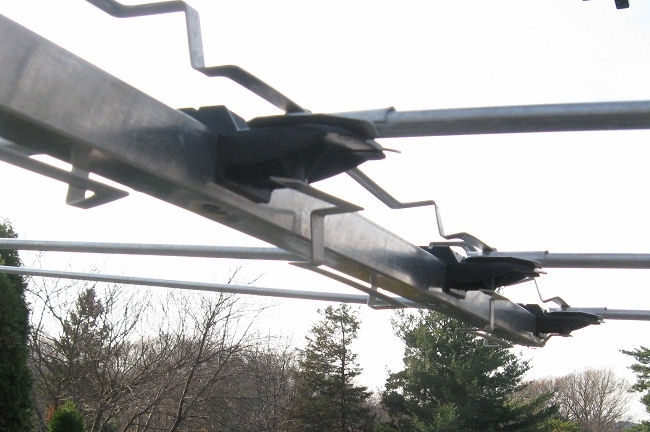 The Winegard HD6055P is a log-Yagi array with eight elements on an 81″ boom. Four of the elements are driven. A shorted transmission line terminates at a passive reflector. The HD6055P replaced the HD6065P, a ten-element design on a 127″ boom. The first eight elements have identical positions and almost exactly the same lengths. It appears that Winegard simply deleted two elements without redesigning the antenna. I modeled the antenna with the AO 9.67 Antenna Optimizer program. This image shows the antenna geometry. This shows the phasing lines in John S. Allen's HD6055P in Waltham, Massachusetts. The lower lines connect to rivets at the underside of the insulators, while the upper lines connect directly to the elements. The rivets electrically lengthen each lower line section by 2″. This causes some pattern asymmetry visible in the plots below. Narrowband dips near 89 and 103 MHz are visible here. The HD6055P and HD6065P use a plastic feedpoint box that snaps onto parallel feeders. I assume that the matching networks are the same. The HD6065P box contains an F-connector and a printed-circuit matching network consisting of thick and thin PCB traces, shunt capacitor, and dual-core ferrite balun. I removed the feedpoint box and measured the 75Ω return loss as > 40 dB at 98 MHz (> 25 dB over 88–108 MHz) with 130Ω and 9.3 pF across the feeder terminals. I set the SWR reference impedance to the series equivalent, 83.6-j62.3Ω. The phasing lines surround a 1″-square boom, but the upper and lower lines are not equidistant from it. This may couple unwanted signals. I did not model this effect. The driven elements mount to plastic center insulators with metallic locking flanges. The slits on each side inhibit current over most of the flange length so I did not model them. Mounting brackets: 5" x 1.5" x 0.5" x 0.05" U-channels, 0.5" reinforcement sheath. Bracket equivalent diameter calculated with YO 8.00. Phasing line: 0.375" x 0.05" straps. Phasing line equivalent diameter calculated with W9CF formula. Driven element locking flanges not modeled. Set SWR reference impedance to 83.6-j62.3 ohms.